Around 9:37 a.m. (CST) Philae successfully landed on craggy comet Churyumov-Gerasimenko. The first signal, a voice from another world, arrived at 10:05. While the lander reached the surface in good health and continues to send telemetry, a small problem cropped up. The two harpoons that would anchor the craft to the comet failed to fire. Right now, mission control is considering whether to re-fire them as well as figure out why they didn’t fire in the first place. 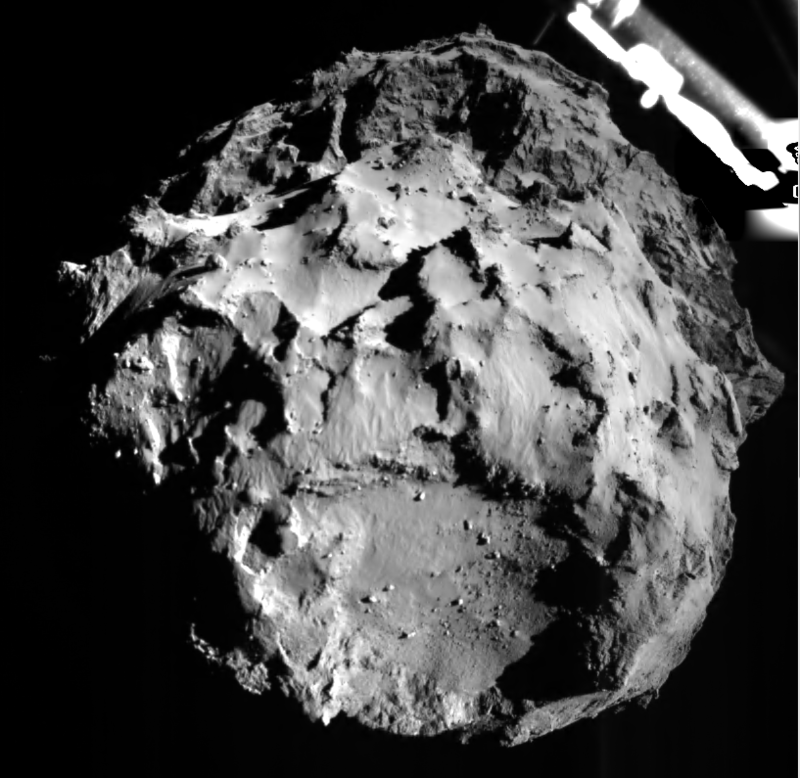 In the comet’s low gravity, it’s important that Philae be sitting stably. Just think what would happen if a nearby jet erupted or ice began to vaporize around or under the craft? Weighing only a gram, Philae might easily tip over. Hopefully we’ll see that first panoramic landscape photo soon. In the meantime, scientists held a press conference this afternoon to share first results as well as some of the troubles the lander faces. “Maybe today we didn’t just land once. We landed twice!” said Stephan Ulamec, Philae Lander Manager. Much is still preliminary, which is why the agency’s scientists are hard at work on the problem. Another live webcast is scheduled tomorrow at 7 a.m. (CST). Live updates can be had on Twitter and the Rosetta website. No kidding. If the craft can’t be anchored, jetting and vaporization could tip it right over. Oh, that would be terrible, after all their years of effort. I hope they can fix it soon. Is there any alternative built in, Bob? I thought there was always some redundancy in instruments. There were three ways of getting Philae to stick: the top thrusters that pushed the craft downward, the harpoons and ice screws on each of its three legs. The first two failed for sure, and I’ve heard that the screws also didn’t function. Still waiting for a confirmation on that. It seems ESA confirmed that screws appear to have dug into surface. This is probably, partly, what they meant by soft landing. As for the pushing-down thruster they knew already before landing that it was not working. After touchdown it seems the lander lifted and rotated a bit but then stopped. You know, escape velocity is 1m/s (better not skiing there, in afterthought). Finger crossed! Just posted the first descent image. Oh, nice! The next live update should be starting in three minutes…. Sorry second link is identical – In the page scroll up to the latest images, there are two surface closeups. I didn’t see that one with the mountain. Nowhere in it does it say what took the picture. It doesn’t look like the right angle for Philae though. Thanks for the link! That mountain has to be taken by Rosetta the more I look at it. Still a cool shot! ESA has only released one descent photo of the comet taken by Philae as far as I can find. Thanks for the Daily Mail link, Giorgio. If you go to the link and scroll down to the twitter picture of the screen with the caption “Although no official images from the surface have been released…” you’ll see a pointy rock with a shadow. The same rock appears smaller in the next image captioned “Almost there!” So it looks like the screen image is from very close to the surface, if not on it. Frankly, I don’t get it, considering the PR and sheer interest value of this remarkable event. I don’t see it. I see another closeup of the mountain but nothing that appears shot by Philae. It really surprises me that ESA hasn’t released at least a few more descent images. OK, I see it. Why is it only there? Nothing on Twitter or the Rosetta site?! It sppears maybe Philae bounced on landing, perhaps rotating and landing again in an unknown orientation. Now it’s out of contact range with the orbiter, and “Officials said the next chance to contact Philae will be around 0600 GMT (1 a.m. EST) when Rosetta again flies in range of the lander.” Hopefully there will updates tonight when it’s midnight in Duluth. Perhaps it did not send back any pictures after landing. But it’s strange to get this from Spaceflight Now, the Daily Mail, and the like and not from ESA directly! I agree. It seems ESA was doing so well up till the landing. I heard that it may have landed twice and rotated, but let’s hope it didn’t land sideways. You’d think there would be a photo but maybe instruments were damaged. Thanks for the link! You’re welcome Richard and thanx for the DailyMail page. Yesterday I also found useful a BBCnews page which posted frequent updates. I too noticed that ESA tended to leave the news aspect, including exclusive pics, more to medias. Possibly a PR strategy, or they simply preferred to focus on work. The live broadcast however was well organized. Now let’s hope the lander is OK and look forward to see the data and images it collected so far. Regarding the neck, yes, that’s what it looked like to me, too. Surprised to see such a small Rosetta Team (6?) in Europe…. when landing on the moon NASA had what seemed like hundreds in the control room. Budget cuts, geniues, or did they die off over the last ten years? Beats me. But did you see the huge audience? The place was packed. (I was thinking this before it had problems…)I think a better design would have been similar to the Mars Pathfinder without the airbags. Mars Pathfinder used a tetrahedral design and no matter which way it landed it could right itself. One thing all space agencies could learn from NASA get those images out, even if they are raw images, as soon as possible. You’re only going to have the limelight so long before it is yesterday’s news. Troy, that airbag design for Mars Pathfinder was superb, and the design fit in with NASA’s Mars policy of “find the water”. So it bounced around to a low point in the crater where it found evidence of water. But ESA did not want Philae to roll into a crater or crevice, and the legged design is much better. It appears it may have succeeded in keeping the lander out of a hole. I’m not advocating the airbags, just the tetrahedral design. They’d still need to aim but orientation wouldn’t matter. Pathfinder actually landed in the correct orientation, but if it didn’t it could just open up and right itself. The ESA had a good system, but every system to land and secure failed, after 10 years in the cold of space it isn’t hard to see why but a slightly more innovative design might have made a difference. News of 1 hour ago with a pic from landed Philae (it’s sending more). It landed not two, but three times. It’s now clear that yesterday it bounced for two hours, hundreds of meters, maybe 1Km high while the comet was rotating below. There was a second smaller bounce. It is now stable, although no harpoons and no screws. No harpoons refire planned, and no drilling, for now, too risky. One leg is off. Sitting at an angle, possible on a slope, but getting data. One issue is that it’s in a shadowed position receiving few hours of sunlight on the panels (why didn’t they make it nuclear powered like Curiosity?). They’re trying to get a photo from the mothership to understand where it is. My personal guess would be in the neck, which would be interesting to monitor activity, but it can be everywhere. Thanks very much for that. Kind of you to send it the link. At least the camera’s working! Using the radar and the comet dielectric properties it’s estimated that the lander is the famous big crater/depression on the front of the small lobe, sitting on the rim, so not distant from the original planned site. It seems all the instruments are working, except that of course they don’t activate those with mechanical properties for it’s too risky with the non anchored lander. – the surface image (the one with the leg shadow in corner we were talking about yesterday) was taken lenn than one minute before touchdown. It has resolution 4cm/pixel. Thank you Georgio. I went back and listened to most of the press conference and shot many a screen grab. Busy this morning with both Universe Today and my own blog. Still have details to add. I appreciate the information you shared. Thanks again!